The drive from Ooty to Bengaluru is a very enjoyable drive. We usually take the shortcut via the 22 hair-pin bends and cross Masinagudi. The drive is a scary one but as usual the Arien did a fantastic job of driving. After Masinagudi, we reach Bandipur. We usually manage a few sightings – a langur, a peacock, a few elephants, etc. whenever we drive past Bandipur. This time however, I did not have any great hopes. Usually, we spot the animals when its early morn or dusk. And we had left Ooty around 1:30 or so after our Ooty-Coonoor travel. The Arien, ever the optimist, insisted on taking out the camera and handing it to me jes in case. It was around 5:40 when we saw some Langurs. 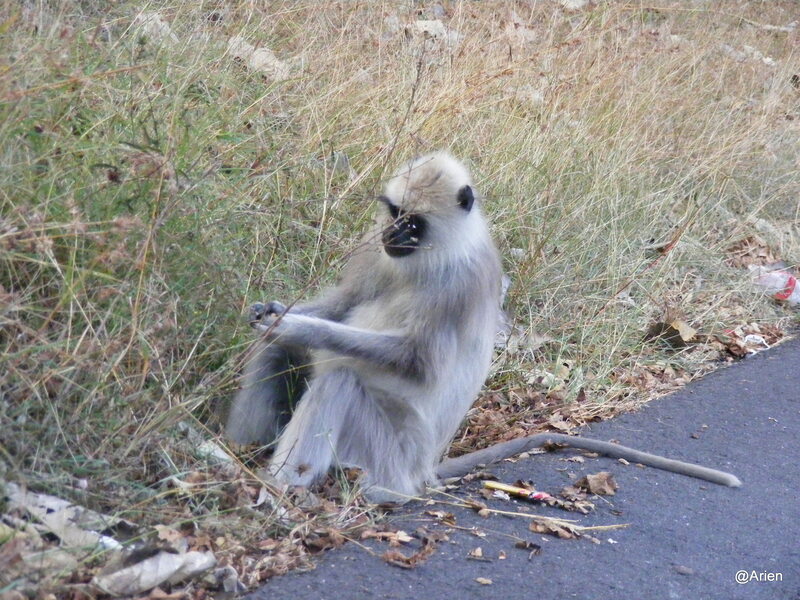 We already had quite a few pics and I was hesitant to take yet another picture but then we spotted this Langur sitting by the side of the road and it was irresistable. The Arien slowed down so we could take a shot before the langur scampered away. And just as we rounded the corner, we saw elephants. The Arien stopped the car so we could shoot a few good pics before they moved away. There was a calf present and the Arien informed me that the elephants would be very protective and walk away quickly and so we have to be quick. 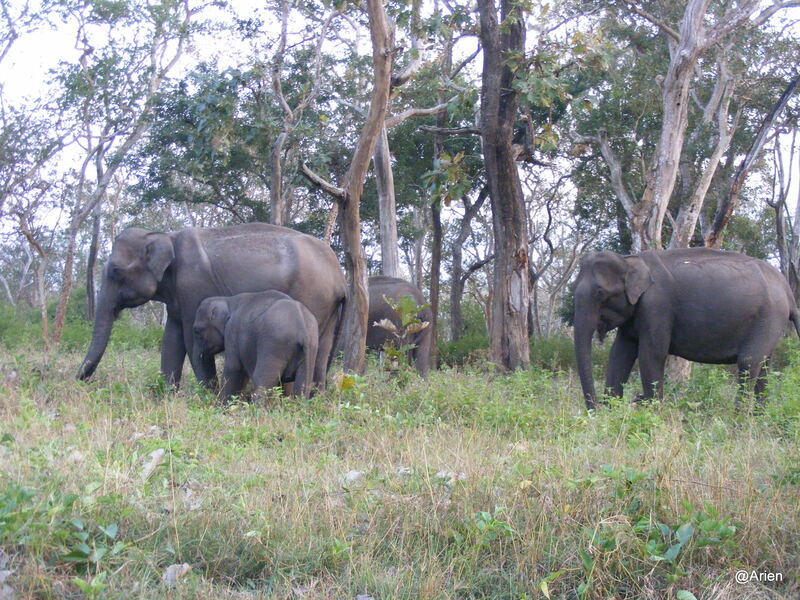 Before I cud say “uhh..”, the Arien took the camera from my hands and took three pictures of the elephant family. And before I cud complain, the elephants moved away. The rest of the journey was uneventful. The Arien had totally enjoyed the holiday and so did not complain ’bout the loong drive home. It was that time of the year….. when we have our anniversary! After having bought our gifts early on – I was not planning on getting surprised – but I was. The Arien surprised me with a trip to Mudumalai. The alarm woke us up at 5 am and for once I did not kick up a fuss 🙂 While I was making coffee and tea, the arien was packing the items which had not been packed last nite. The Arien surprised me with a very funny card, a lovely bouquet – I have no clue how he managed to keep it hidden. I was more than a lil embarrassed b’cos I had not got him a card – I felt a total goof 😦 My mood was restored after I went over his card – I laughed so hard – I had tears in my eyes 😀 We were ready by 6:30 am. However, we were not going to be starting the journey to Mudumalai so early – we visited the church, dad, my grandmom, his mom – had breakfast of hot pooris with alu palya and started arnd 11. I was actually sleepy by the time we started. By the time we reached Kengeri – we had been wished by most of the family members. B’cos we had had a heavy breakfast at 10:30, we were not ready for a major lunch when we reached Kamat – so we settled for the breakfast which they continued to serve arnd lunch time: Idli vada and Maddur vada. The drive became extremely boring post Nanjangud – the roads were really bad – the drive can be best summed up as Thud – Thud -Thud -Thud – Screeech – Thud – Screeech – Thud Thud Thud – Screech 😦 We finally reached Bandipur – and saw Jungle Lodges resturant – remembered last year and went on ahead – the road was a wee bit better and soon we were into the forest area – it was not yet dusk – everything looked so calm and peaceful – the sun was in my face – and I was hoping to shoot snaps of any animal that we could get our sights on – when the Arien shouted “Did you see that?” As I turned to watch, I saw a Sambhar deer (it was quite tall – in comparison our car looked like a dwarf) bolt past as the Sumo coming in the opposite direction braked hard. It took me a minute to realize that I had the camera and we lost the best shot 😦 The Arien went on and on ’bout how the Sambhar deer looked on both sides before it made its move – which was at a rapid pace – and I was feeling all woebegone till the Arien told me tht it had bolted so fast – no one cud have taken a snap – tht cheered me somewhat and I continued to hunt for animals. We saw dozens of spotted deer, langurs, and also caught sight of a peacock on our way to Mudumalai. We almost went past the peacock – I made the arien stop and reverse so I could shoot the peacock as well as I could. I was very surprised that we managed to catch sight of so many animals. We moved on and reached the Karnataka check post – crossed it – and wen t on to a bridge tht was oh so typically TN – and then we saw the Tamil Nadu check post – and drove across the mudumalai reserve. However, we did not catch sight of any more animals. We did see a lot of burnt wood – black remains of wht was once a tree 😦 Looks like there had been a forest fire and so ob. the animals did not venture near the road. That was indeed sad. We reached the first town that was Masinagudi – we were pretty close to the destination and we sent up a prayer for a good holiday. We stopped and asked for directions and followed a jeep that was owned by one of the various resorts at that spot. As he led us down the winding road, we stared at the amazing Nilgiri mountains that is close to Mudumalai and noted that the mountains indeed look blue. We took the turn that lead us to Bear Mountain resort and soon we had arrived. The first sight that greeted us after we parked our car and got out – was the reception area. It was one of those traditional hut type thingie… we recieved a warm welcome from Rudra, the manager and co-host, the Arien got busy filling out a form and I was trying hard not to shiver – it was awfully cold. The Senior Arien had advised us on carrying sweaters n stuff – we heeded that but I felt we must have ear muffs or something. Another group landed while we were waiting and soon we were escorted to our cottage. The cottage was a welcome respite and the hot water that was available a blessing – I was soon really glad we had gone ahead with the plan inspite of the bad reviews. We had some snacks and went in for the evening tea at arnd 8 – it was horrid – we decided to have snacks so we could wile away the time till dinner. All the best spots were taken – they had these coal thingies for keeping warm and all of them were in use – three families were holdng sway over the downstairs area – and most of them were snacking on Chicken 65 and the like. We headed to the Bonfire after indulging in Finger Chips – tht were not crispy enough. We were a disparate bunch consisting of 4 different groups- one was a family, consisting of an old father and mother, their two children, wives and grandchildren, two was a bunch of 4 telegu speaking, chicken 65 eating, beer drinking men who acted like they were in their home, three was a bunch of arnd 10-12 loud talking bunch of arbid ppl – I assumed college kids, and us truly. I got fed up of staring at the fire and soon we were busy playing Dumb Cs and having a lot of fun. Dinner was served at 9:30 p.m. when the kitchen was finally closed for starters – I am sure no one can have dinner after stuffing themselves on the snax – anyways there was a sizable group of ppl waiting for dinner. We had planned to go for the nature trek the next day. It was not part of the facilities provided but we felt it was a good exercise for us lazy travellers – we were supposed to be ready by 7:30 am. The trek was supposed to be for 2 -3 hrs and we would have breakfast after the trek. Sounded like a good idea – we confirmed our names and yawned our way back to the cottage. We also noticed that there was another bonfire on our way back – it was probably for a huge group that wanted their own lil bonfire… Interesting… Yawn!! End of Day 1. Nish on Happy New Year 2015 – I am Back!